Everyone, if they wanted, can have access to Photoshop. It’s surprising that software with such a niche purpose has become an almost household name. Much of that success, though, is thanks in part to years of controversial photo doctoring, or overly manipulated images that have become viral hits within the online realm. This is especially the case with the government. Society loves to ridicule those at the top, and when they can’t even employ someone to properly utilize a piece of software, it just opens up more doors to humiliation. Here are 8 of the Most Epic Government Photoshop Fails Ever. 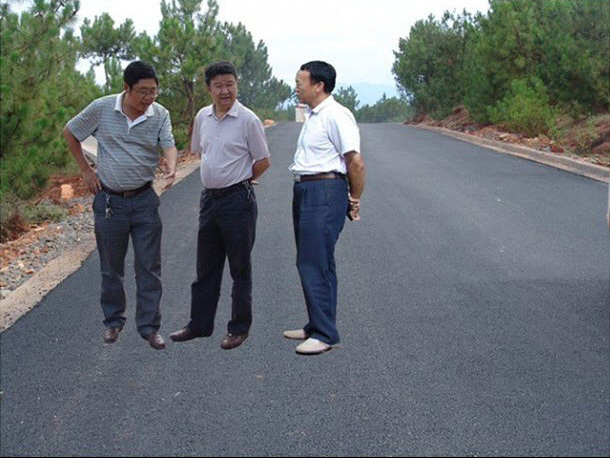 The most famous government Photoshop blunder came when a photograph was shown with three Chinese officials ‘inspecting’ a road. The picture included the mayor Li Ningyi and vice-mayor Tang Xiobing. The only problem, apart from the fact they were never there, is that the positioning of the Chinese officials was largely off; giving the illusion that they were levitating above the road. Soon after this image entered the public realm it faced a plethora of ridicule and sparked a meme all of its own simply titled ‘Levitating Chinese Officials’, whereby they were placed in bizarre locations; such as the prehistoric era or the Moon. No, this isn’t the same meme as above, although you’d be forgiven for thinking otherwise. While not as ‘floaty’ as the Chinese officials, it’s not hard to spot the problems with this picture. The red jacket guy, especially, displays exceptional balancing skills on those rocks, whilst the chap on the right has a perfectly horizontal chop off his haircut. Upon closer inspection it also appears as if the same guys can be seen in the background of the image. Look even closer, and it appears as if they didn’t even have time to wear helmets. Rather than being honest and saying they didn’t have the time to visit the stricken area, they attempted to fool everyone with poor computer engineering. 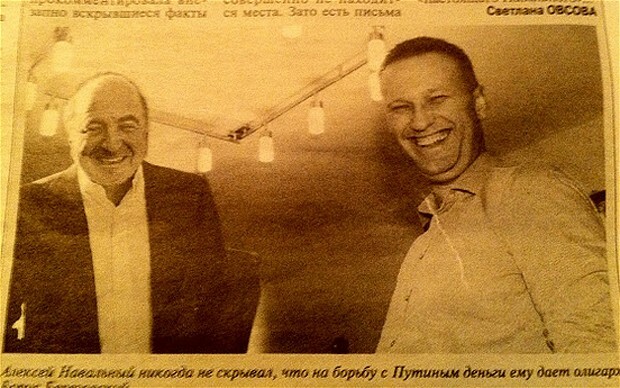 Earlier this year, a Russian newspaper published this image of the time when Navalny (an anti-Kremlin activist) met Berezovsky (a Russian oligarch who is wanted for criminal activity in his country). The image was, in fact, tinkered with by pro-Kremlin activists who were attempting to run a smear campaign against Navalny in the lead up to the March 4 elections. Ironically, Navalny was hanging out with a different oligarch at the time this photo was taken. Once this was made public, Navalny mocked the slanderous allegations made against him by creating his own humorous doctored photos on his blog. A photograph aimed to show the traffic on the “peripherique” in Paris was an obvious Photoshop job doctored by ex-minister, Denis Baupin. The photograph shows streams of vehicles travelling on the road, with a few drivers displaying an impressive flare for reverse driving. While not a pretty sight, it’s clear to see that this is not what was happening at the time. 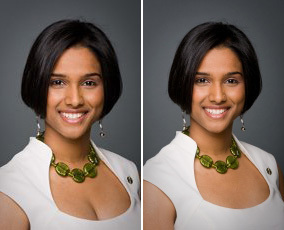 Canadian MP Rathika Sitsabaitesen had her portrait Photoshopped when the neckline of the shirt she was wearing revealed a little too much cleavage. The amended PG version of the photograph was welcomed and took the place of the original. While not so much a blunder, it was an obvious alteration that needed to be made before being made visible to the public. The UK’s Tendring District Council use human cloning as their main selling point in this advertisement. Not only have the same people been used over and over again in close proximity to their doppelgänger, but the designer also thought a cheeky reverse image flip would be enough to fool viewers into thinking these were different people. 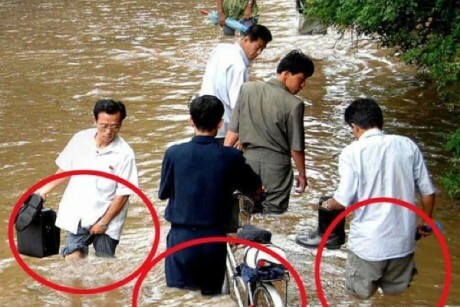 Once again, North Korea were caught out with a Photoshop fail after Associated Press believed a picture submitted to them was altered to exaggerate the floods, in an attempt to get more international aid. Following this discovery, AP ordered all pictures to be withdrawn immediately. It’s surprising how crappy these manipulations are, especially considering the government was behind the funding. You’d think they could find someone learned enough to do simple manipulation. The second picture above, about Philippine Officials, was one of the biggest issues in our country recently. Atleast some photograph were convincing but the 1st one is blunder.